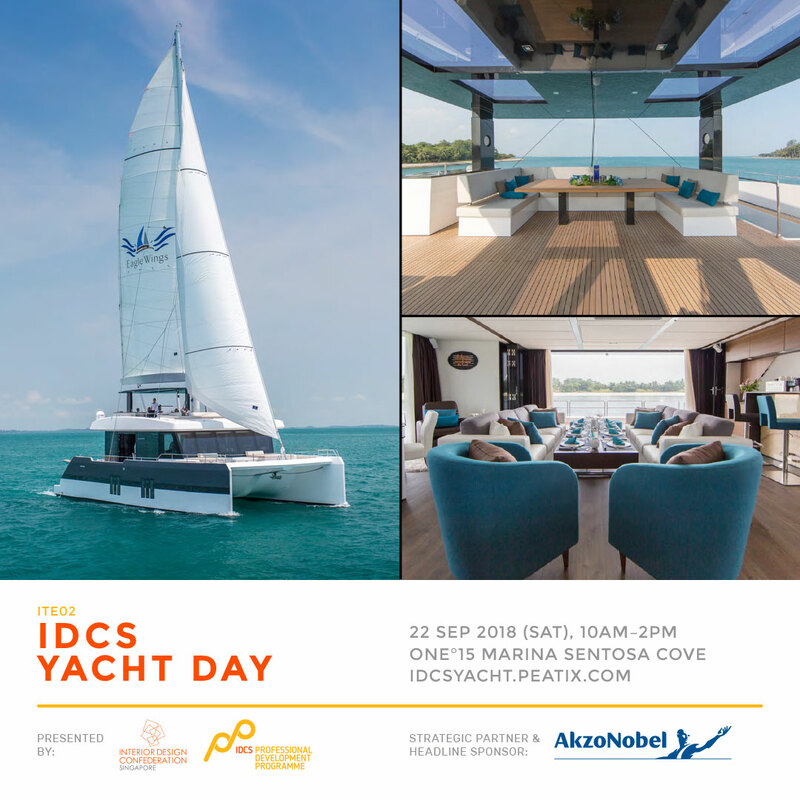 IDCS is hosting a Social Networking Day for Members and their families with a half-day yacht cruise on the Eaglewings 68ft Catamaran out to Lazarus Island from 10am – 2pm. Join us for lunch and get to know your fellow interior designers in the process at this exciting event, sponsored by AkzoNobel. 10:00 AM: Depart ONE°15 Marina Sentosa Cove. Sail along the south coast of Sentosa Island. Cruising along the southern waters of Singapore before heading to Lazarus Island. 11:00 AM: Drop anchor in the sheltered bay at Lazarus Island. The perfect spot to enjoy your lunch and swimming activities. 1:00 PM: Raise anchor and head up to the Marina Barrage and view the city skyline and Singapore flyer before cruising back to ONE°15 Marina through the tankers moored in the harbour. 2:00 PM: Disembark at ONE°15 Marina Sentosa Cove. Conditions: All participants must know how to swim. Participants register and attend at their own risk and safety. Buffet lunch is provided and non-alcoholic drinks. Alcohol can be purchased at your own cost. Maximum 50 people can board. EagleWings Bar: EagleWings Bar is stocked up with the best alcoholic beverages and as well as exquisite wines from around the world, which can be purchased at your own cost.